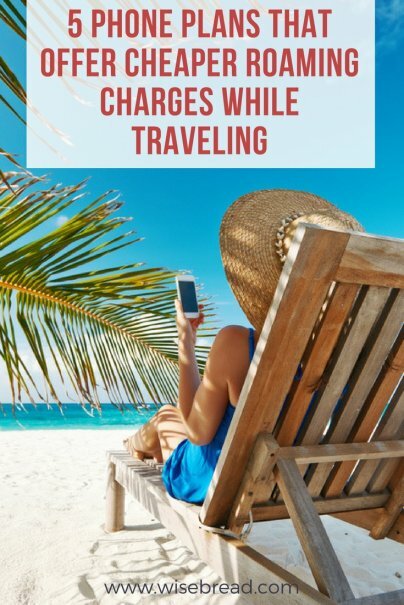 To save you from running up unforeseen bills on your travels, check out these five phone plans that offer cheaper roaming charges. The International Day Pass from AT&T allows you to take your existing plan with you on the road so you're able to use your data, minutes, and text message allowance. It covers you in over 100 countries, is easily activated online or by calling them, and once it's added to your device, it stays there ready to go for each time you head abroad. To qualify for the International Day Pass, you need to have a Mobile Share Plan or the AT&T Unlimited Plan. Conveniently, you only pay the $10 daily fee on the days that you actually use your package, rather than for each day you're abroad. T-Mobile's One Plan aims to be the simplest, most transparent plan on the market and this objective remains the same when it comes to taking it abroad. There's no need to change any settings on your account before your trip because international roaming comes as standard. You're able to use your unlimited data in over 140 countries, but only with speeds of up to 128 kbps. This is fine for browsing the web or checking emails but no good for streaming or downloads. If you need higher speeds, you can upgrade to the One Plus plan for $10 per month to get 256 kbps. Texting is also free with the plan. Depending on how many lines you have, prices T-Mobile plans can be as low as $40 per month. With Sprint Global Roaming, international roaming coverage is enabled at no extra cost in more than 200 countries. In 165 destinations that are deemed "low service areas," the package also includes free texts, free data and low-speed data, and calls at just 20 cents per minute. It should be automatically configured on your smartphone without you having to do anything, so you can simply up and go whenever you want without having to worry about changing your package. The service supports data speeds of up to 2G, which is good enough for basic web usage and things like map navigation, but won't cope with streaming or downloading. If you're a heavy user or need quicker speeds, Sprint has high speed data add-ons that will give you speeds up to LTE. In most destinations the cost will be $5 per day or $25 per week, and you can add this service even if you're already abroad. Sprint's basic plans start at $40–$60 per month. Verizon's Travel Pass plan is virtually identical to the AT&T International Day Pass, allowing you to take your existing plan with you to over 130 countries for a daily fee. In Mexico and Canada, you'll pay an additional $5 per day, and $10 per day in other countries. You'll be able to use your talk, text, and data. You only pay for the days that you actually use the service, and not for each day that you're abroad. Verizon's regular unlimited plans come in at $75 per month for a single line and go as low as $40 per line ($160 per month) if you have four lines. Google's Project Fi virtual network came up with a unique way of pricing its plan to give people the ability to only pay for what they use. You pay a flat rate of $20 per month for text and calls, then you pay $10 per GB of data that you use. The plan's simplicity means that it remains exactly the same providing you're in one of the 170+ destinations where they provide coverage. One thing to note with Project Fi is that you have an extremely limited number of phones to choose from that are compatible with the network. Depending on where you go, local sims are often the cheapest way to get data at a far lower price. Having used these all over the world, in my experience, they usually range in price from absolutely free to around $10. You can then access local prepaid rates that tend to be cheaper than international roaming rates. Wi-Fi hot spots are available virtually everywhere, many are free of charge, and they can also provide quicker speeds than cellular data services. If you're able to save your online activity for when you're in range of one, or at your hotel or in a coffee shop with Wi-Fi, you'll save even more. There are lots of apps available that help to extend your data by compressing it, so you use less than you ordinarily would. Many apps also have options in their settings to compress their data usage, including the Chrome browser, Facebook, and Instagram. Lots of apps use your data even when they're not actually being used, which can lead to those unexpected, and unbelievably high bills upon returning home. Your process to restrict or turn off background data usage depends on what model of phone you have. You can ordinarily do this in settings or on specific apps.